We enjoy cooking in our home. If I am not cooking then hubby is grilling. It is something we enjoy doing. I also love to try new foods and flavors. You never know when you will come across something that you will really like. 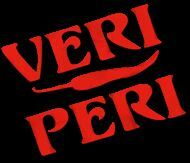 I have heard of Veri Peri Sauces before but had never tried them. The sauces looked very good and it seemed like a sauce that my family and I would enjoy cooking with. I was delighted to have the opportunity to do a review on the Veri Peri Sauces. In fact, I was sent 5 different sauces which allows me to flavor and try the product several different ways. Veri Peri is an emulsion, meaning it does not separate when used in cooking, this lends itself to a versatile range of usage. Add Veri Peri to dips, your favorite recipes, use it as a marinade, or simply offer it on your dinner table for guests to add to their mean as desired. Unlike other hot sauces, Veri Peri is the family sauce with something for everyone. Our flavors are Lemon & Herb, Garlic, Mild, Hot, and Veri Hot ranging from 1/10 - 10/10 on the heat scale. During my review I was sent five different Veri Peri Sauces which include: Lemon & Herb, Hot, Mild, Veri Hot, and Garlic. After looking at each flavor I couldn't wait to dig right in and start making some food that I could incorporate these sauces into. My hubby went right for the Veri Hot and Hot which is no surprise to me. For my hubby the hotter the better. He tried it on several different things. He made himself some chicken on the grill and he also made some burritos. He really loved the flavors and the elevated heat that these sauces offered to the dishes. He really liked how the sauces cooked into his chicken. I tried the garlic on some baked chicken. It didn't take long while the chicken was cooking for the smell of the garlic sauce to fill my kitchen. When the chicken was done my family ate up the whole chicken there was nothing left. The flavor of the garlic was spot-on and really cooked into the chicken very nicely. This was a great alternative to fried or baked chicken. The Mild, Lemon & Herb was great as well. The mild was perfect in our tacos for taco night which the kids love. This sauce hit the spot on flavors. Even the kids gave it a try and really liked it. The Lemon and Herb makes for a great pork chop dish. It is just as tasty as the garlic but offers a totally different flavor. It cooks in and really elevates the pork chop. I am really happy with my sauces my only complaint I wish I still had more sauce left. 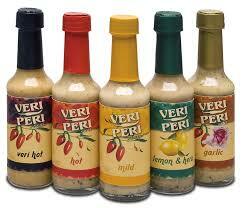 Where to purchase: You are able to make a purchase from the Veri Peri Sauce website for $4.99 per each bottle. Veri Peri Garlic Sauce! I t must be wonderful! Want to to try the mild.